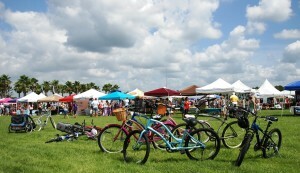 Over 3,500 residents and community guests gathered for a “BMX-Treme” themed Farmers Market on July 20th, in the Nocatee Town Center. The day of family-friendly fun featured three action packed BMX stunt shows from X-Games’ medalists who demonstrated various half-pipe and flatland tricks. Perfection on Wheel’s BMX Pros Trick Team wowed the crowd with a variety of stunts at each of their three shows. SORBA-JAX (Southern Off-Road Bicycle Association) was also on hand to promote safe cycling, bike education and their active Jacksonville chapter that meets regularly for trail riding in the Nocatee Preserve. In addition to the amazing BMX performances, everyone enjoyed unique photo opportunities, inflatable slides, activities for the kids and so much more. Joining this month’s special entertainment were more than 80 local vendors offering a wide variety of delights that included baked goods, organic produce, honeys, local restaurant favorites, hand-crafted jewelry, artwork, herbs/spices and more at the newly relocated Farmers Market Field in Nocatee’s Town Center. The Market is held every third Saturday of the month between 10:00 a.m. and 2:00 p.m, and is open to the public.